Seasons Finest has proven itself as a leader in the field of fine dining where seasonings, spices and sauces are a major component. Seasons Finest has created its own brand of blended spices, to complement and create mouthwatering and exotic taste to please any palate ranging from general to the most discerning. 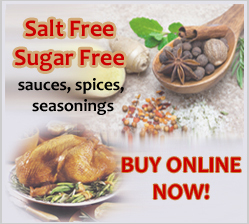 Season's Finest offers some products that are Salt Free, Sugar Free and Low Sodium keeping your health in mind and providing you a nutritional value to your diet. 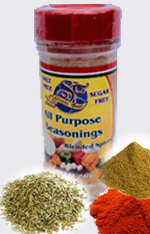 Our seasonings are made from all Natural Spices without preservatives, artificial flavors, colors, or sweeteners. 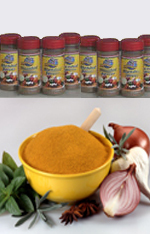 They will enhance the flavor of your cuisine and add a zest of flavors to unsalted foods. All our seasonings are available to buy online. Please click on the product to buy. 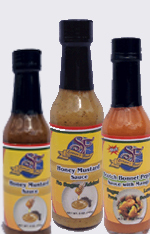 Our sauces are an excellent complement to seafoods, meats, poultry, casseroles, soups, salads and vegetarian dishes. Our sauces replace the mundane taste of ketchup and mayonnaise. They can also be used as marinade to produce that special mouthwatering, savory taste to your food. Seasons Finest spices will add to flavor your cooking. We guarantee it will satisfy all palates. 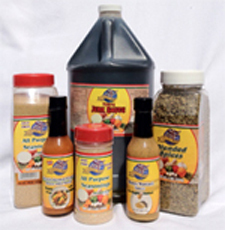 Please check the wide variety of Spices and Sauces we offer you to choose from. Choose from our Salt Free, Sugar Free and Low Sodium products! "My diet food never tasted so delicious before! The Scotch Bonnet pepper sauce with Mango added the much needed zest to my bland and boring food!" "The Salt and Sugar Free All Purpose Seasonings was the perfect seasoning for the grilled chicken." Site created by KR Creations, Inc.